The Bushehr nuclear power plant in southern Iran. 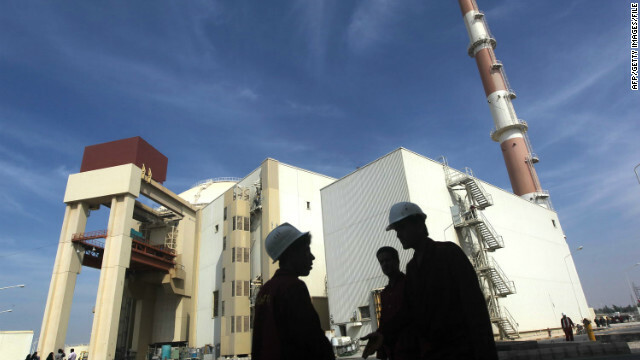 Iran faces new sanctions over its nuclear program. President Barack Obama announced new U.S. sanctions targeting Iran's oil Tuesday, warning Tehran that it faces "growing consequences" for refusing to answer international questions about its nuclear program. The first set of sanctions announced will target the Islamic republic's energy and petrochemical industries, a move designed to "deter Iran from establishing payment mechanisms for the purchase of Iranian oil to circumvent existing sanctions," a White House statement explains. The statement continues, "Sanctions are also authorized for those who may seek to avoid the impact of these sanctions, including against individuals and entities that provide material support to the National Iranian Oil Company, Naftiran Intertrade Company, or the Central Bank of Iran, or for the purchase or acquisition of U.S. bank notes or precious metals by the government of Iran." The second set of sanctions will target banks, "a significant step to hold responsible institutions that knowingly enable financial transactions for designated Iranian banks," the statement said. The Department of Treasury specifically targeted Bank of Kunlun in China and Elaf Islamic Bank in Iraq. The two financial institutions are alleged to have facilitated transactions worth millions of dollars for Iranian banks that are under sanctions because of the country's nuclear proliferation activities, according to the statement. "By cutting off these financial institutions from the United States, today’s action makes it clear that we will expose any financial institution, no matter where they are located, that allows the increasingly desperate Iranian regime to retain access to the international financial system," the statement says. The U.S. will continue seeking a diplomatic solution, the statement says, but if Iran keeps defying the international community the U.S. and its partners will work to "impose increasing consequences." "Since taking office, we have presented the Iranian government with a clear choice: Come in line with your international obligations and rejoin the community of nations, or face growing consequences," the statement says. "With these actions, we are once again reaffirming our commitment to hold the Iranian government accountable for its actions." Western powers have long alleged that Iran is attempting to build nuclear weapons, while Iran has insisted that its program is solely for peaceful civilian energy purposes. The president is handling the Iran matter as well as can be expected. Certainly smarter than the neo conservative solution... meaning another costly war. And we all know that Romney would be their next puppet after W. No thanks. I prefer a steady hand and acting in unison with our allies. Diplomacy must *always* take precedence over war...when all else fails, that's when we should beat the war drums. More blah blah blah...and when they finally announce they have the bomb...more sanctions? TALK, TALK, TALK: WHY, is it always the good old U.S.A.? Sanctions, YES, until EVERY other country that is saying "NO NUKES" for Iran has SIGNED and gone world wide that they will participatge in military force! And even if they do the U.S.A. is NOT the primary country providing troops! We, americans, need to cut isreal of from our teet, and let them handle there own. Without america isreal would not last a year. Take heart mikey for there are many that do not live within a Police State; They exist in spite of the state and those who live within and for that State. Look,let's stop all these stop gap sanctions,someone needs to come up with a total complete absolutely final world sanction list and put it in place for Iran.We keep "Nickel and Diming"these sanctions with Iran and at this rate we may see results in the year 3000.In my view the Israeli government is not going wait until our elections are over and they shouldn't.Not only does Iran deserve to be attacked on their Weapons Program.They are a major supplier of IED to Iraq and Afganistan insurgents that have killed our soilders since 2003.